Today was a bit of a mish mash day - visit to the dentist, trip into Birmingham, bit of work from home, ferrying the children around and so on. I didn't need to be too smart but given that I was in the shops I didn't want to be too much of a scruff either. So I resorted to my trusty Cos trousers and then worked in a bit of colour and texture with stripes, a wool jumper (almost the shade of Cadbury's purple - well, we are in Birmingham) and a scarf. I had a navy coat on for most of the day and the shoes definitely worked better when I had the coat on than when I didn't but carrying two pairs of shoes with me just so that I could change when I took my coat off wasn't going to happen. Ever! For once I was actually warm - not convinced that I am ready to lose too many layers yet though. Unlike many, I haven't quite mastered the art of stripping off to strappy tops as soon as the sun shines. I have a friend's 40th birthday party to go to on Friday night and there is a picture in my head of how my outfit will look. No doubt the reality will be somewhat different! This is the top half of it and is made up of some items from my summer capsule wardrobe - silk vest, white blazer, sparkly necklace and stacked heeled shoes. There is a mixture of gold and silver going on but it doesn't matter. I can imagine that I will use this combination with varying different "bottoms" during the spring and summer from skinny to flared jeans and peg, to wide smarter trousers. On Friday I am considering wearing the above with some pleated black palazzo pants that I have just bought from Topshop. It all depends on whether or not I think that I look like a plonky head [a term invented by our eldest when she was about three, and used on a regular basis, to describe looking silly or like an idiot, or behaving in a similar way] - and if I do, the palazzos will be returned from where they came! 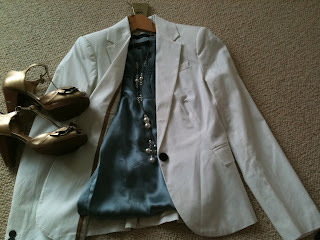 Outfit: Jacket Zara, Silk vest Coast, Glass beaded necklace Wallis, Shoes Carvela. I was shopping with a client today which meant that comfort was paramount. There was also the issue of whether it would start off cold and end up hot but I decided that there wasn't much I could do about that so ignored it on the basis that I could deal with it later. As it was it rained so it wasn't a problem at all. I thought that it was time to give the navy lace Mango skirt a day time outing and so after the self imposed ban on navy, sequins and stripes yesterday put it with a navy sequin jumper (under which there was a striped top). My cream leather jacket is great for this time of year so that went on with the red shoes and navy patent bag. Last night I made a conscious decision that today there would be no stripes, sequins, spots or leopard print in my outfit. I wear all of these, in varying amounts, on an almost daily basis but they are not for everyone so I wanted to have a change. Monday is the day of doing fun activities with our youngest, interspersed with various domestic chores. The day started off foggy but brightened up later on. By way of a change I went for a grey and pink colour combination. 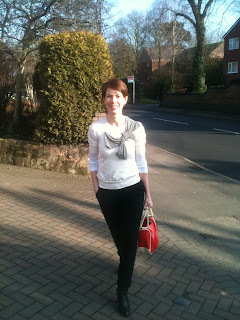 I played with the proportions by putting a longer top with a cropped cardigan which had three quarter sleeves. 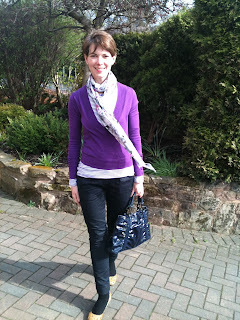 The outfit was pulled together with a scarf and a lilc longchamp bag. It was OK but I am looking forward to getting back to my usual stripes and navy - watch out for tomorrow's outfit! My trusty Cos navy peg trousers, which are a great alternative to jeans, meant that I could wear my denim shirt, which does a good job of keeping me warm. Double denim never really did it for me, I have to say. 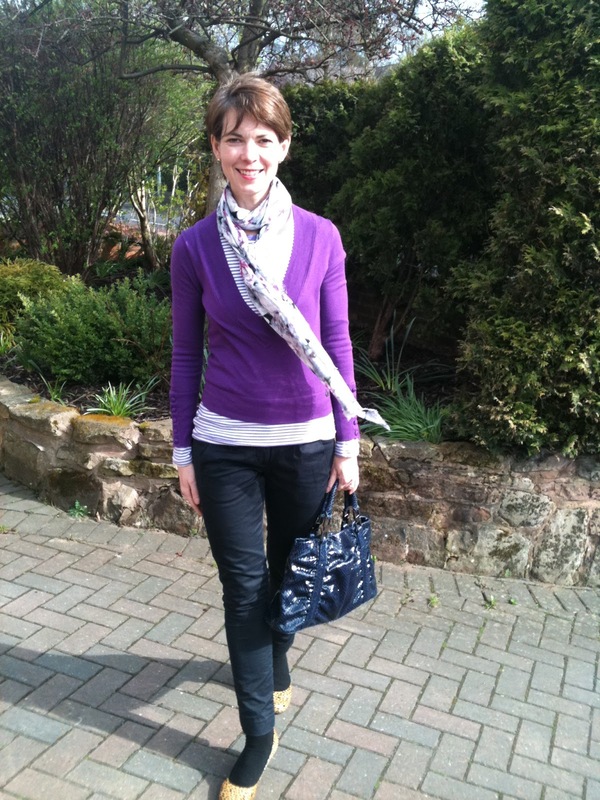 I layered a pink top underneath and added my new printed Zara scarf, which pulled all the colours in the outfit together. Turquoise converse and my oilcloth Cath Kidston bag were practical and colourful additions. Oh, and not forgetting the oh so cool knee length M&S socks - in grey! There are so many of us in our house wearing black socks that I have had to resort to grey so that I can identify mine easily. So chic! I had a great time last night at the Radisson hotel in Birmingham, doing a style evening with some of the city's top PA's. They were a lively chatty bunch, which was fantastic. Earlier in the day I did a Wardrobe Consultation with a lovely client. As we sorted through her summer clothes she pulled something out and proclaimed "Great, the dog's bandana" - I have come across some unusual items in people's wardrobes but that is the first dog's bandana that I have seen. Cool dog! Today I did some shopping - for me! I have spent the last month or so shopping for everyone else but today it was my turn- not that I am wearing any of it below! As it was such a lovely day we did the long walk to school and back, hence the converse. 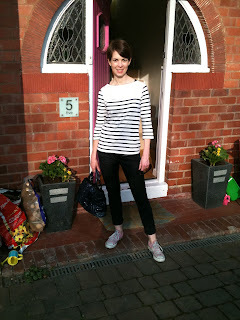 I also wore navy peg leg cotton trousers and my striped H&M top. None of earth shattering but it did the job as I truly was a Mum on the Run and a Mum in a rush today. Just so that you know, I am giving myself a day off tomorrow, returning Sunday. Have a great weekend! Shoes are always tricky at this time of year, so I have some suggestions for you of ones that are pretty, yet practical. 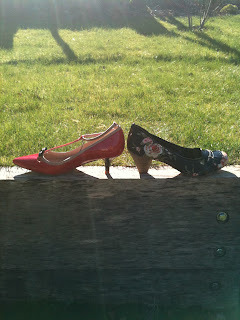 The red ones on the left are from Zara - they are red patent and have a kitten heel and ankle strap. They are more limited in their appeal in one sense as they will only work for women with slim legs and ankles but if you can get away with them go for it! The ones on the right have a pretty floral print, a mid height heel and they are from Dune. They will work well with black work trousers, cropped trousers, jeans - plain skirts or dresses - pretty much anything really and will just lift the black clothes that you probably haven't yet cast off. 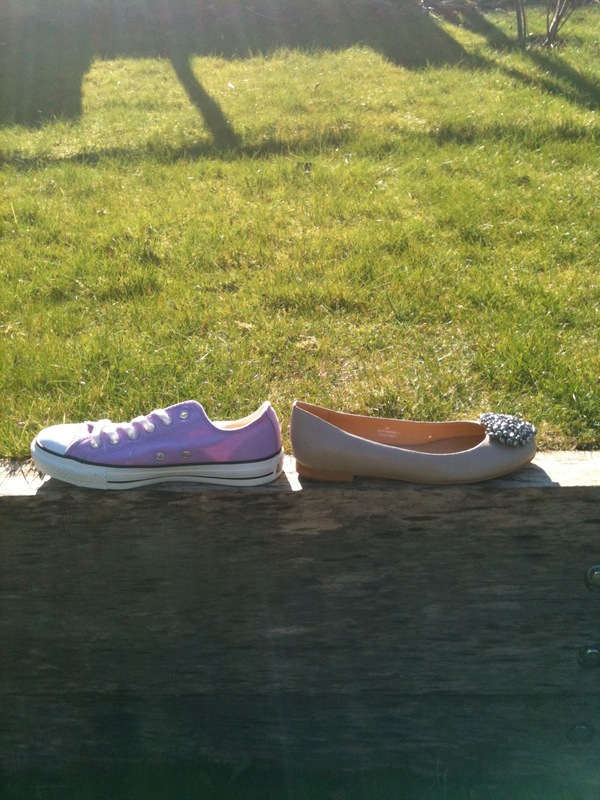 Here are some flatter shoes - good old converse, which you can get in many colours (Jones, Office, Schuh) and which have now earnt their fashion stripes as a design classic. They can be worn with jeans and also with dresses and skirts to give them slightly more edge. On the right is a pretty pump with a bit of bling on the front - not too much though! They are from Jones. 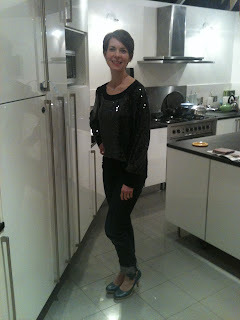 Mum on the Run - Sequins again! As it was such a sunny day I decided to wear my new sequin T from Topshop again. I was invited to be the guest speaker at a fund-raising lunch for St Mary's hospice and I wore the sequin T with my navy peg trousers and red patent shoes. 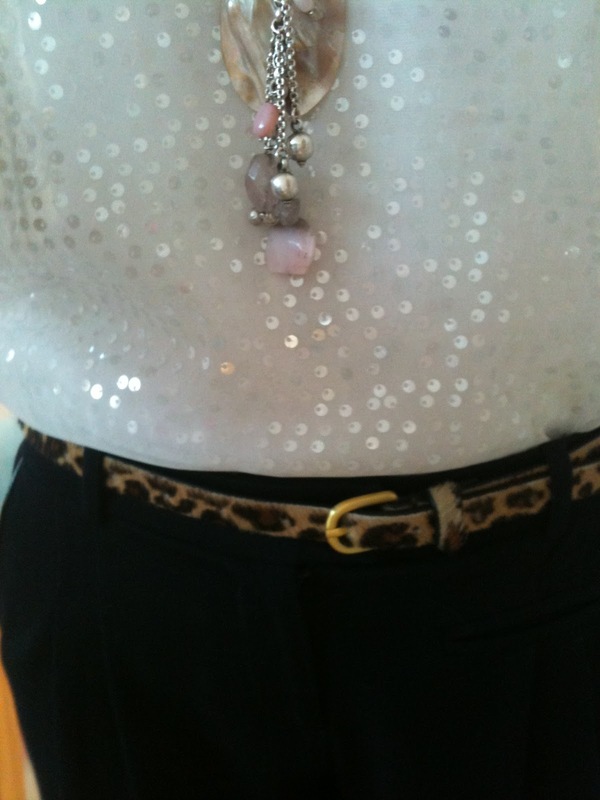 As there was no one around to photo me (well apart from a room full of women having lunch that is) I took this photograph myself to show how I accessorised the top with a pendant and leopard print belt. Thanks to the lovely ladies who came along and thank you for the bouquet of flowers. Later on in the day I decided to walk the three mile round trip to get our eldest from school. 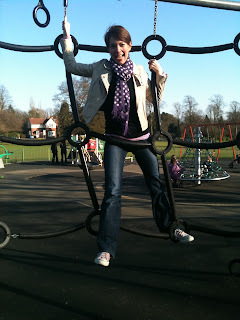 I swapped the trousers for jeans, the red patent shoes for converse and left the necklace at home. I didn't have time to change my navy patent LK Bennett bag though so that had to come along for the walk. Another day in paradise - well, the Bull Ring in Birmingham, but for me it's pretty close. I was shopping for a Style Party that I have tomorrow night - 6 lovely ladies with varying different requirements which is great as it keeps me on my styling toes. I knew that it would be a long day and that I needed to be comfortable so on went the Oasis ankle boots, followed by the Whistles utility trousers. I added a cream lace top and black blazer to make the top half it a little more feminine and a little smarter. 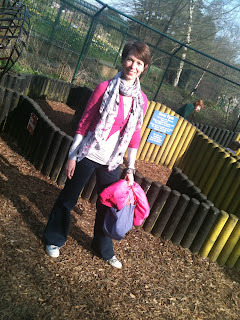 Hidden under the blazer for warmth was a pink cropped cashmere cardigan from Boden. For the walk to school later in the day I just swapped the trousers and boots for jeans and pink converse. I can't believe that it is Monday again - my favourite day of the week as I get a day at home with our youngest which normally means swimming, seeing friends, trips to the park and the kinds of bizarre conversations that you can only have with a three year old. The weather for the day looked promising and I just felt that it was time to break away from the clothes that I have been wearing all winter - so I looked to my new Topshop cream sequin top for a bit of sparkle. Because it is fairly delicate looking I didn't want to over power it with a bold scarf so I chose a pale pink jersey one. 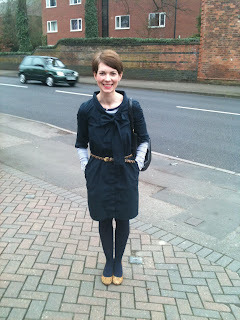 I also layered a long sleeved white top underneath and a navy cardigan over the top. Jeans, coral converse and my orla kiely tote meant that I was sorted. 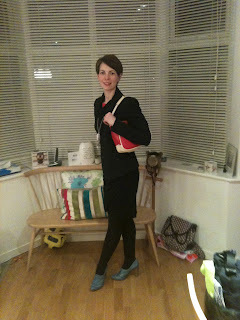 Last night saw me doing another style party, which was great fun but late! I mixed my fabrics (lace) with embellishment (sequins) but stuck to the same colour palette (navy) and kept the rest of the outfit plain so as to avoid too much going on. I knew that today had the potential to be tricky. After too many late nights I am tired (and it shows!) I had a meeting first thing and although I didn't need to be overly smart as it was a work meeting I wanted to make an effort. 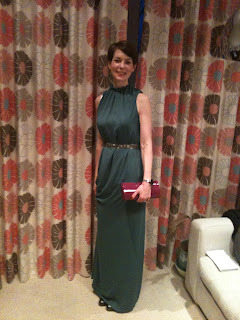 I hadn't planned what I was going to wear but as I fell asleep last night I had the words in my head "keep it simple". 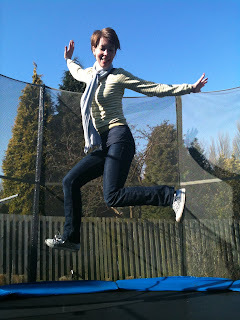 So I did - navy trousers, navy long sleeved top layered under my navy v neck bat wing jumper. Can't get much simpler than that! 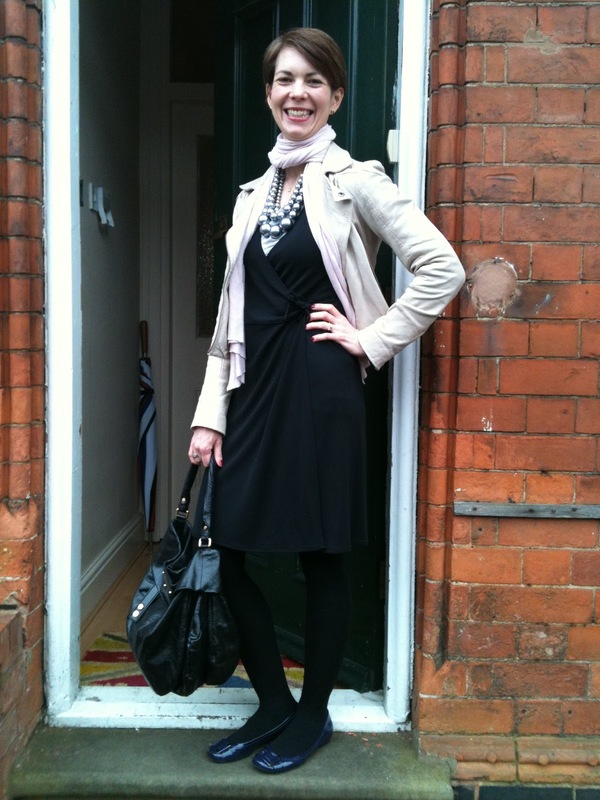 Then I stuck on a long necklace, a bright coat and added my heeled ankle boots and Marc Jacobs bag - which I ought to swap but I love it and anyway I didn't have time! Now that I am home for the afternoon with our youngest I have swapped the trousers and boots for jeans and converse and the necklace has long gone. This started off as a monochrome outfit but didn't end up that way, due to the addition of the bright shoes and teal scarf. What can I say? I like a bit of colour here and there. Today was an unusual day for me as I had some time at home. I did a quick gym trip, which was followed by a visit to Vintage Beauty to get my nails shaped and polished. The lovely Kally did it for £5 and it was definitely one of the best £5 that I have ever spent. You can find her at http://www.vintagebeauty.co/ So, I now have nice bright pink nails for my meeting tomorrow and my Style Party on Saturday night. After doing some jobs at home (ie sorting out the rat man to come and sort out our rats - what a glamourous life I lead) Caroline from Caroline's Cake Company http://www.carolinescakecompany.co.uk/ then visited for a cuppa. If you need a special cake, she is the lady for the job. This evening I am off to see our eldest in a dance production at school. With lots of dashing around and four children for dinner tonight, I knew that I wouldn't have time to change . So, has this outfit done the job for me today? I reckon so - although I wasn't really demanding that much of it other than being warm, comfortable, casual enough for the day and smart enough to go out this evening - OK, may be I was being quite demanding! The dress is comfortable and layering a long vest underneath stopped it from being too sheer. The addition of a black cardi kept me warm whilst the scarf just injected a bit of colour next to my face. 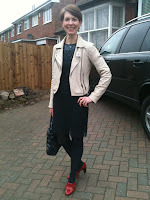 I always like wearing my Reiss biker jacket - it just stops things from being too twee. It's not my favourite but it was OK.
My husband had left for London by 6.45am today so it was all hands on deck to get the rest of us out by 7.45am - well I say all hands - in true management fashion I delegated many tasks to our eldest two - including sorting out breakfast for the youngest (which I have just realised is still there - yum, soggy cheerios). After all, how long do they need to get a school uniform on? So anyway, last night I had decided that today would be the day of my shirt dress. I duly ironed it - I know, how impressive is that - and put it on with a stripey top underneath, leopard print belt and I started out with red patent flats. I was distinctly out of sorts - the dress felt too short and the shoes were too flat. The tights were more of a royal blue than a navy but the ones that I had taken to change into after I had been to the gym turned out to be for an 11-12 year old. Not a good start. I could have cheated and changed my outfit but I wanted to stay loyal to the philosophy behind Mum on the Run so I stuck with it....and bought a pair of shoes to sort it all out. Well, what's a girl to do when presented with the shoes that she has been looking for for ages, that are comfortable, redeem the outfit and are at a good price? Exactly. That's what I thought too! The belt and shoes veer on being a bit matchy for my liking but there was no way that I was going to change the belt after buying the shoes. That would have been just a step too far! 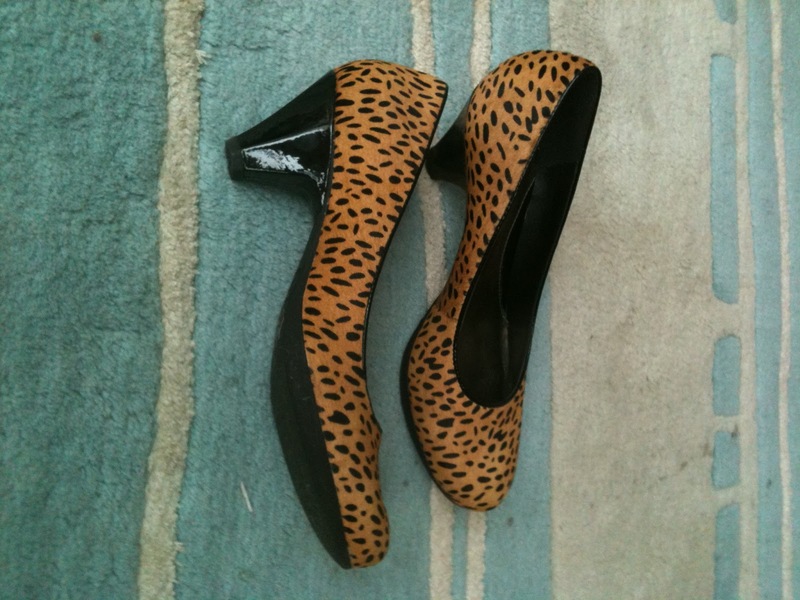 So, here are the shoes - bit of an animal print, bit of a heel, bit of patent and guess what they say inside - "softwear". Soooo chic! They will go with lots of things though so I am happy. Today I was shopping for the second of my Style Parties that I have coming up and in case you didn't know, there are some great sales out there at the moment. I decided to give my Gap wrap dress an outing and I jazzed it up a bit with a statement necklace, which I then "unjazzed" a bit with a scarf. I added patent ballet flats, my leather jacket and my favourite Marc Jacobs bag (which has now dried out from its bath in Diet Coke - what a crime!) I'm not too good with flats but the proportions of the dress, in terms of it being fairly fitted but with a bit of "swing" in the skirt, meant that I felt OK. Even more importantly I was comfortable and warm - two things which, as you may have gathered by now, are really important to me! My shopping trip was followed by a run and a cuppa with a friend before embarking on the various school runs and trips to tennis etc. All in all not a bad day! Yes - I know I look as if I only have one leg but I can assure you that all is well in the leg department. Another sunny Monday found me "at home" with our youngest doing the school run, food shop, cooking, playing in the garden and ballet. We were up and out by 7.50am, as usual, and it looked chilly so jeans were the obvious choice with layers on top as the weather looked promising for later in the day. A mixture of stripes, sequins and an animal print scarf kept the cold at bay but added interest to a definite stay at home outfit. Anyway, I was out last night at a charity event and this is what I wore - a simple column dress which I had spotted in Zara earlier in the week. I liked the fact that it was so simple and not black. It came with a really pretty belt and as it had a high neckline didn't require a necklace. I was short on time in getting ready so the fact that it didn't need much accessorising was a good thing! Having now worn it for a night out, I think that I will have it shortened to wear on those long hot summer days (dream on) with some flat sandals. 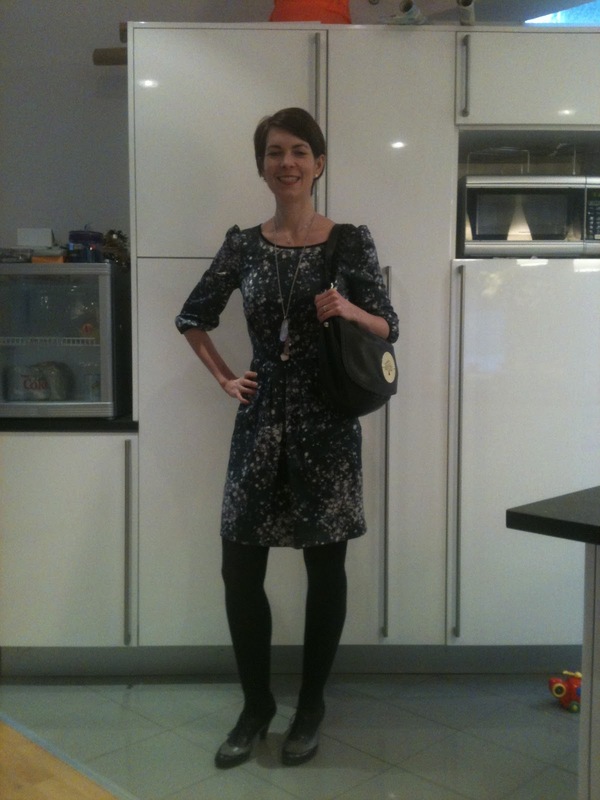 Outfit - Dress Zara, Shoes LK Bennett, Bag Reiss, Watch Storm. 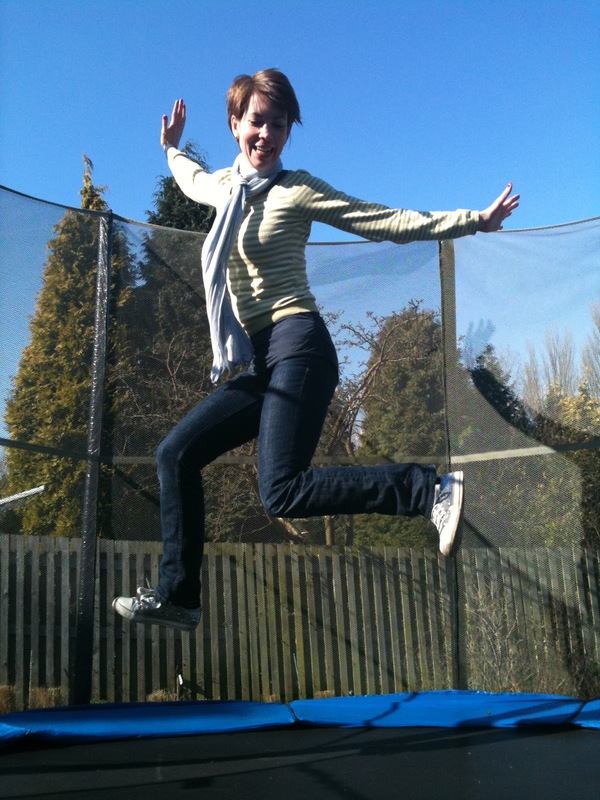 Having spent the morning shopping with our daughter, I decided to spend a bit of time outside with the other two who wanted to go on the trampoline. This also gave me the chance to hang out the washing - I know, the excitement of it - and take photographs of where the shed had been broken into (the insurers needed it). On reaching the shed I realised that it had been broken into again - my, the commitment and dedication of the local thieves - but all was not lost. Fortunately the police had used the other side of our fence to put up a notice with their number on it, should we find that we had been the subject of a crime. How convenient was that? So, no more than sixty seconds later and the crime was reported. As we are "repeat victims" someone will be out to see us within the next hour. Great service but I do wonder whether their energies might be better spent three miles down the road in the heart of the city. So, to the outfit. 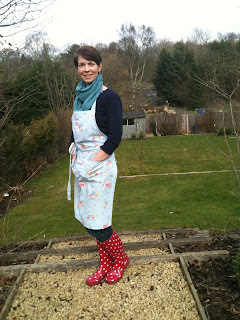 Having removed the boots that I was wearing for my earlier shopping trip I simply donned my apron and spotty wellies and I was done. Tres chic (or not) as the case may be. Mum on the Run day 24 - Party party! This evening saw me doing the first of three Style Parties that I have coming up. I love doing the parties as people really seem to enjoy trying on things that they wouldn't necessarily choose for themselves. However in one sense the Style Parties are the least glamourous of everything that I do because they require so much lifting bags of clothes, rails etc in and out of the car and up and down flights of stairs. 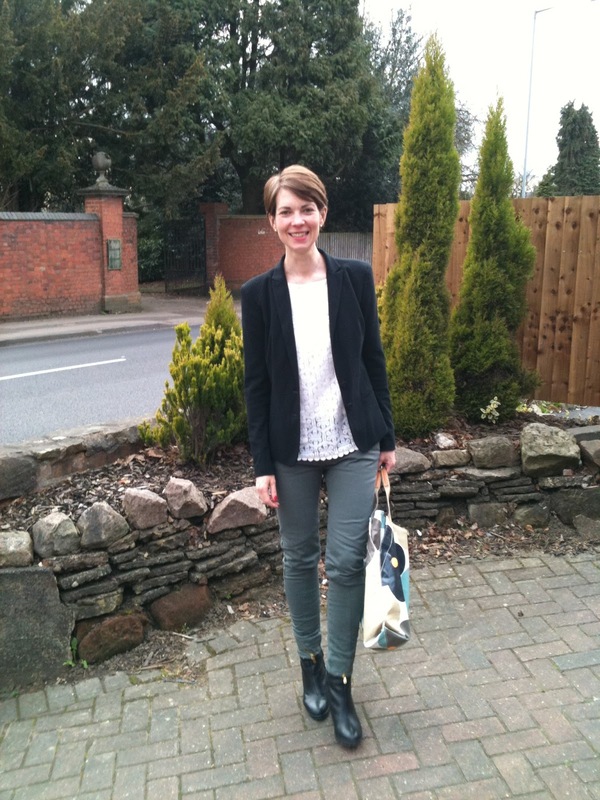 So, with that in mind I went for my practical Gap utility trousers but smartened the outfit up a little with my LK Bennett grey shoes, a new printed silk shirt from Warehouse, my Gap blazer and a silver belt from Boden. I like the juxtaposition of something fairly basic, like the trousers, with a much more glamorous silk shirt and patent shoes. It worked for me! Apologies about the photo - it has been a really busy day today and I am whacked! I styled the most lovely lady today- she is Spanish and has come here to learn English, which she is doing incredibly well. Unfortunately my only Spanish comes from Dora the Explorer. She made a much better job of communicating with me than I did with her but we had a fabulous day. So as to remain true to the philosophy behing the "Mum on the Run" feature, I wore the above shoes all day, as a result of which my feet were killing me at the end of it. The styling day was followed by cooking several meals and herein lies the rub - an extraordinarily large gin, made by our daughter - hence the dodgy photo. No amount of blusher and lipstick could rescue me! Mum on the Run day 22 - Colour pop! 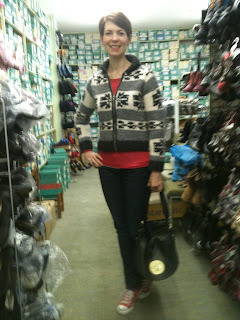 Today was another shopping day - just finishing off for a style party that I am doing on Friday night. The shops are a whole different ball game, even compared to last week. There are lots of lovely things out there! I wore my comfortable Oasis boots together with skinny navy blue trousers from Cos. 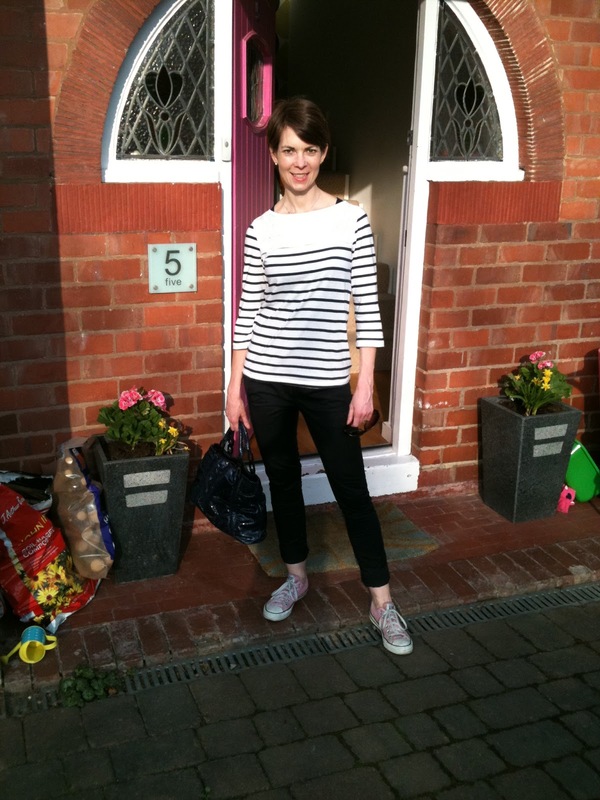 I also layered two long sleeved tops - a breton one from Jigsaw (which I think are better than the Petit Bateau ones despite what the fashionistas say!) and a cowl necked one over the top, from Cos. 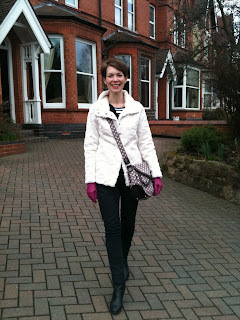 I finished off with a fake fur coat, bright pink gloves and my favourite item - my pink spotty bag bought for me by my hubby. Top marks Mr G! I felt cosy all day, comfortable on my feet and the gloves added a nice splash of colour to an otherwise fairly plain outfit. Today I was talking at the "Women Who" lunch for the Birmingham Chamber of Commerce. I did a presentation on the15 essential items for the work capsule wardrobe. Everyone was lovely, as were the cakes, yum! 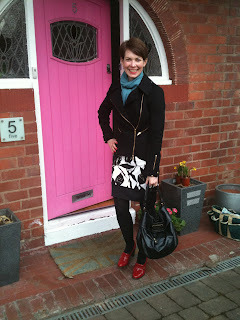 It was nice for me to have a chance to dress up as pretty much every day since I started "Mum on the Run" I have either been off with the children or shopping on my own - neither of which require the same sort of outfit as when I am with clients or doing events. Today I decided to go with a bit of a nod towards the ballet look (I thought that the full on look might be a tad ridiculous) which is so big at the moment, thanks to Black Swan, and went for a chiffon pleated skirt from TopShop. I put it with a black silk blouse, a fitted cardigan, a skinny leopard print belt and court shoes. It was lovely to have a chance to dress up and to wear a pleated skirt - something that I haven't worn in years. It felt quite elegant (for once)! To stop the outfit from looking too twee, I added my chunky Storm digital watch. We also did a bit of a Marilyn Monroe look but we were laughing so much that I look a bit weird - I said there would be bad! What a beautiful day it was today and for me that can only mean one thing - being outside. 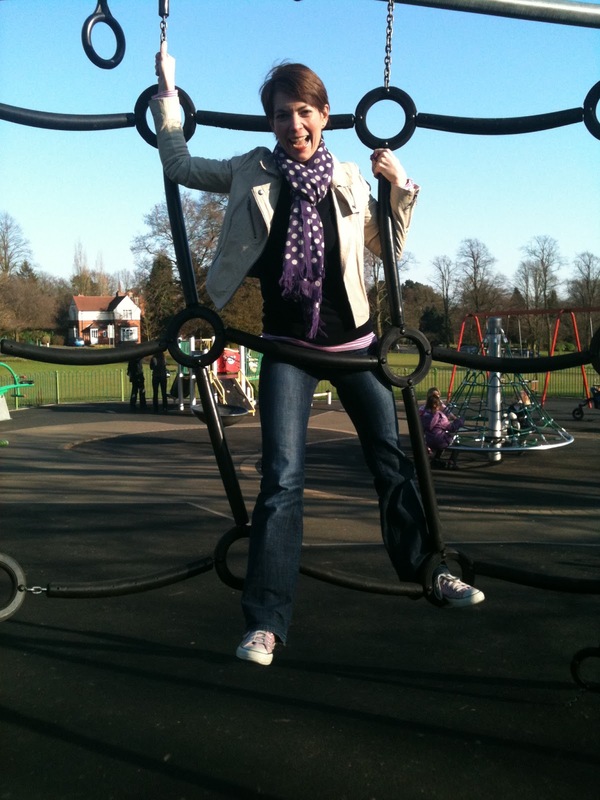 Monday is my day off with our youngest, so we can usually be found swimming, at the park or at home baking. We did the baking but today swimming was abandoned in favour of the Botanical Gardens and later the park. This was followed by a trip to ballet and then walking to school to collect one of the other two. There was a lot of pressure on today's outfit - I needed to be able to walk a long way comfortably; I needed to be cool enough after pushing the pushchair up hills but warm enough to walk back from school at 5.00pm when the temperature had dropped. I tell you, those stars in LA have it easy - constant temperature plus never walking anywhere! 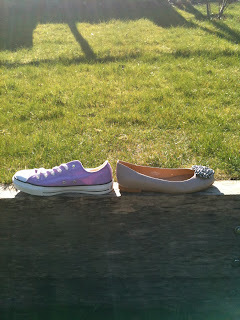 So the footwear had to come first and I felt that it was time to dig out the faithful pink converse. They have served their time but they are still a firm favourite. Gap jeans together with two long sleeved tops layered on top of one another (one pink stripes, one plain grey) a navy v-neck jumper and my cream leather jacket did the job for me today. I also added a spotted scarf (which double up as mittens for the youngest on the way home) and a cocktail ring -which is completely out of sight! I got as far as taking off the jacket whilst walking but the rest stayed firmly on. Nothing could persuade me to lose another layer - not even the people wearing shorts! Having worn this outfit for a couple of hours, before discarding it in favour of jeans, I decided that the image of the outfit in my head was better than in reality. However, as I always say my clients, let's take the positives - there are usually some! The length of the jumper (ie fairly short) worked well with the waistband on the skirt, as it didn't cover it too much - which meant that the silhouette was neat. I also like wearing ankle boots with a skirt or dress as it makes it a little edgier. I think that my problem lay in the volume of the skirt - there was just a bit too much fabric. I have spotted another skirt in Zara which is slightly less full and I think it will do the trick. 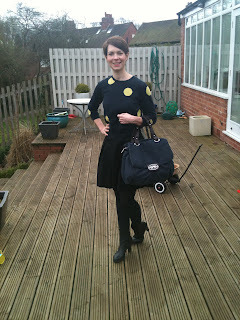 You may be able to see that I have mixed navy and black and I was happy with that combination. Day 18 - Jobs but fun stuff too! I don't know about you but I have this notion in my head that Saturdays will somehow be different from every other day of the week - carefree, relaxed, harmonious with me wafting around in a lovely dress and heels. The reality is so different. Saturday has become the day to catch up on all the other jobs that I should have done in the week - so I am really a Mum on the Run in its most basic form. Hence the outfit above! Because my husband is also at home, the front door is often open whilst he goes about sorting out the detritus left in the car by the children during the week (bless him!) Or the windows are open, or the back doors and so it is just chillier than normal. I figure that I have two options - whinge, or just put more clothes on. This week I decided on the latter and wore my snowflake cardigan from Cos - I really love it, in a naff Wham (Last Christmas) kind of way! I think that it will soon have to be retired from my wardrobe until next winter, so it's good to get the use out of it whilst I can. The photo is taken in a shoe shop, whilst shopping for school shoes for our son! However, we also had friends coming over for an early dinner so I changed my outfit to something a little more exciting. 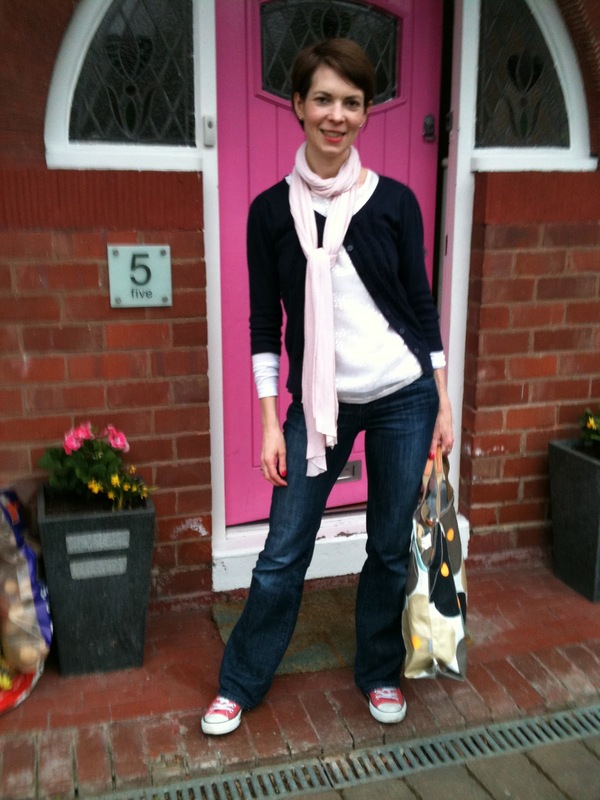 I kept the same jeans , but turned them up and swapped the shoes for some high ones with a flower on the ankle strap. I also swapped my top for a sequinned one. Outfit 1 : Gap jeans, Jigsaw jumper, Converse, Cos cardigan. 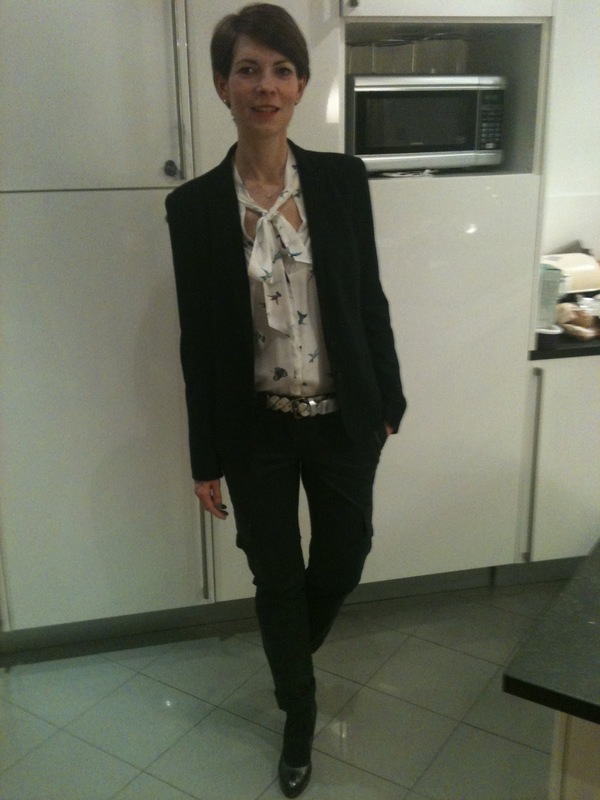 Outfit 2: Gap jeans, Reiss top, Jigsaw shoes. Today was a bit of a mish mash day - running first thing, haircut, food shopping, working at home, collecting leaves in the garden and ferrying various children to tennis/ballet etc. I felt like wearing a skirt but knew that I was likely to be cold whilst sitting at the computer so I went for the usual thermal tights. 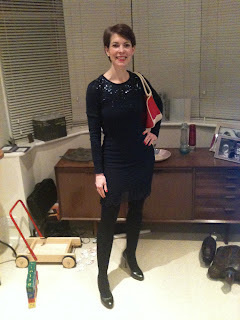 I also layered two thermal vests underneath my navy sequinned jumper and then added my long Cos cardigan for extra warmth. My skirt is tulip shaped and because it is fitted, I can get away with wearing a looser long line cardigan over the top without it bulking me out too much. I don't think that it would work as well with a fuller A-line skirt as there would be too much fabric. 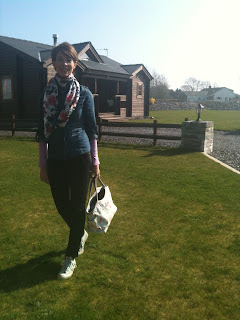 All in all the outfit worked well and later on I swapped the skirt for jeans and wellies when in the garden. If I had had more time I would have dug out some other shoes for a change but Mum on the Run was running so as not to be late - so the red ones made another appearance! Today was another full day of shopping - hurray! This time it was for the first of three Style Parties that I have coming up in the next few weeks. I have scoured the shops - H&M, Topshop, Mango, Oasis, Warehouse, Gap, Zara, Coast, Karen Millen, Reiss, Whistles, Hobbs and the rest to find the best pieces that I can - and boy do my arms know it! Again, comfort was fundamental to me today, which saw me reaching for my two tone heeled brogues. 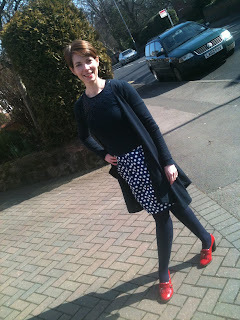 Flat brogues wouldn't work on me - I would feel a bit too police womanish but the slight heel helps. They also go really well with my "paint splash" dress from Marks and Spencer Limited Collection - which I love. It is just the right shape for me and whilst it is fitted, it is not tight. 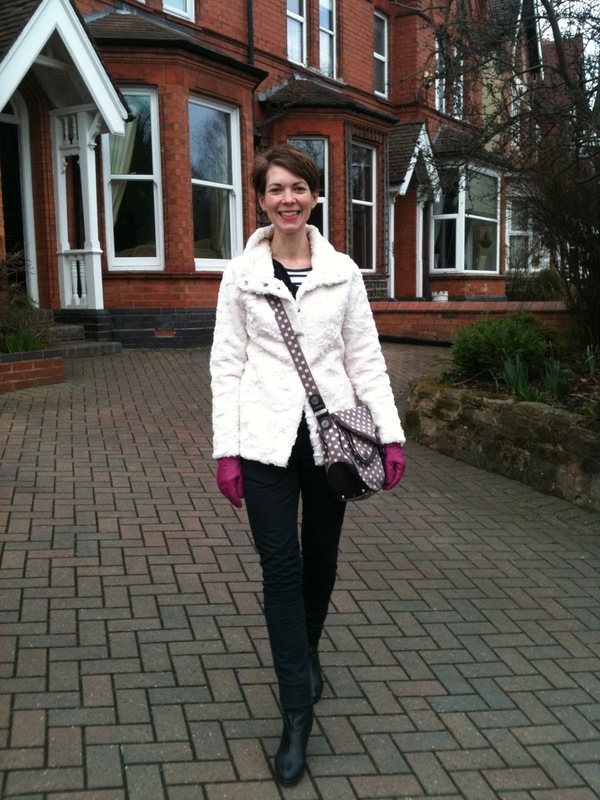 I also added a long pendant and, for when I went outside, a pale pink jersey scarf, a black blazer and my grey Mulberry bag. Today I was shopping for an event that I am doing for the Birmingham Chamber of Commerce next Tuesday lunchtime. I knew that I would be shopping for a good few hours so needed to be sure that I could be both quick on my feet but also comfortable. I am not a big fan of sweatshirts or plain t-shirts - but I really liked this Ted Baker one - which is half way between the two. I see it as more of a "nod " to the sports luxe trend than the full on works. I have put it with my navy peg leg trousers and heeled ankle boots. The addition of a pea coat and my bright red bag saw me sorted for the day. Outfit: Trousers Topshop, Sweatshirt Ted Baker, Boots Oasis. Today was meant to be the day that I spent a good few hours in town shopping for some forthcoming events. I had chosen my outfit with one thing only in mind - practicality. As these events require me to buy lots of clothes the shopping can be hot, hard on the legs and heavy. It was for that reason that I opted for sensible footwear. 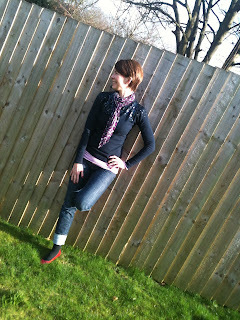 Jeans soon followed in the practical stakes followed by a navy sequin jumper, biker jacket and a striped scarf. As it was, I largely spent the day at home as our eldest was under the weather but not to worry, there's always tomorrow (or the next day) for shopping. Can't wait to feast my eyes on all those lovely spring clothes! 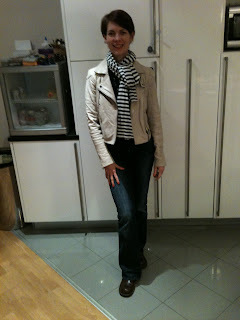 Outfit: Jeans: Gap long and lean, Biker boots Hobbs, JumperWarehouse, Scarf Zara, Jacket Oasis.